Here at Smartwcm, we hope to increase the power that is given to our clients so they can have the capabilities to properly manage all of their web applications themselves. We can assist you in creating the web solutions that enable the streamlining the operations of your business so you can attain the results you desire for your company. With an architectural style that is flexible and open, we make it much easier for you to add technologies and additional capabilities as they are available. Smartwcm has the abilities to not only aggregate the contents you desire, as well as the data and all other desired information so it can be accessed and understood by your audiences as they are targeted. This will also provide them with user experiences that are highly optimized no matter the device they use to access your web pages. 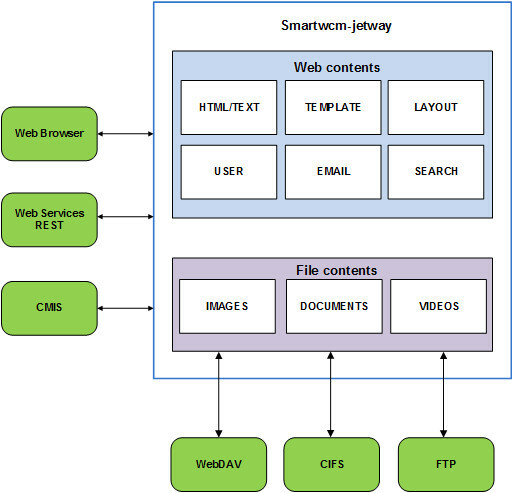 When it comes to Smartwcm, it was developed with a view that permits a platform that is open so critical web content management can be done by businesses. This system also provides a solution that is not only integrated but also comprehensive so you can build your online solution from nothing. It gives you a point of access for the creation of a site that is based on your layout template, so you can manage all the contents, users, media assets and various application modules. This also reduces the cost of web operations while providing capabilities range that enables you to meet your objectives as they pertain to your business. Smartwcm was engineered and designed in a way so that its content is completely separated from its design, which is used to present it. In Smartwcm, there are multiple templates in which you can choose your content's layout and design presentation. If you would rather create your own design template, it can be uploaded into Smartwcm for easy access. With these abilities, you can have the same content displayed with different styles and approaches, so it will appear unique and interesting to the visitors. This option offers convenience and flexibility to the site administrator. Smartwcm with the ways it is designed is completely tunable as per the business/usage requirements. The user/web module, the admin module, and the service module can be configured and run independently as different applications running on different physical servers. This allows the business to have the flexibility to configure each of them on servers with different capabilities in terms of processing power, memory and storage. The admin module might be accessed by less number of users who is mostly the administrators or the content writers. But the web/user module might be accessed by public users. Depending on different requirements these layers can be run on servers with different performance capabilities. There are so many WCM vendors out there who offers you similar web content management features that Smartwcm provides with their inline editing and customization capabilities. But, the main difference we have is that Smartwcm is simple to use and any business user admin can easily figure out how to use it. When it comes to customization, serious businesses cannot rely on these cookie-cutter solutions which will give you a lot of liabilities on them. Other solution providers are complex in the way their platform is designed and you will need to spend a really good amount of time learning their way of doing things for you to be able to customize it. Also, while during data migration, it will be a complex procedure. You will have to hire technical people who have expertise in that platform only. At Smartwcm, we are using the traditional libraries that are commonly used in web application design and nothing is complex. So, all the tasks such as the customization, site management, and data migration become very effortless. All the data consumed by the web/user module of Smartwcm is done by calling a few REST based web service calls. And these REST services can be configured to be served by the same network or a completely different network. This gives extra power to the website owner to customize his website. He can decide how he wants to use those data exposed by the web services. Developed on libraries that are open sources, Smartwcm provides plenty of room to incorporate the best of the breed in features. Our goal is to constantly make improvements to our products so we can include all the latest features. It makes easy use of our products and the ability to tie them into any products that they may already be using. It also offers the ability to customize Smartwcm features as their requirements need. It also gives the opportunities to run it in the cloud environment at a partial or full hosted level. In instances when you want the content to stay on the cloud, our team can provide all of the required configuration adjustments. Keep up on our always evolving product features and technology. We provide you additional services based on your requirements.